Entertaining is a snap in this open-plan home that is as appealing from the rear as it is from the front. The airy foyer is overlooked by the second floor balcony which also overlooks the great room, distinct for its columns, fireplace, and gracefully arched openings. The master suite, secluded on the first floor, features a tray ceiling. A garden tub with a picture window is the focal point of the master bath that also contains a double bowl vanity and linen closet. Upstairs, both bedrooms are highlighted by cathedral ceilings. 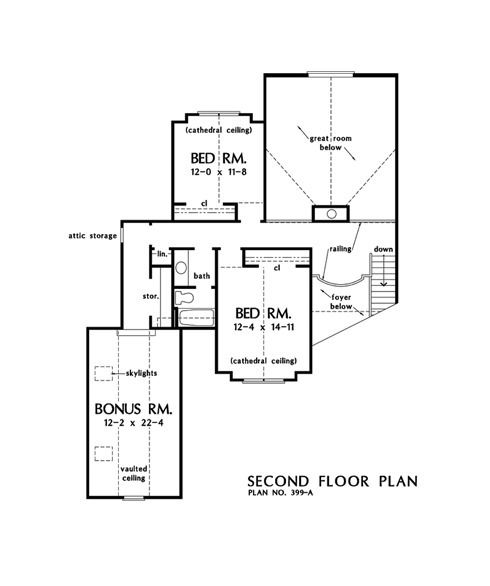 The skylit bonus room provides abundant storage or expanded living space. 1st Floor: 1894 Sq. Ft. Bonus Room: 375 Sq. 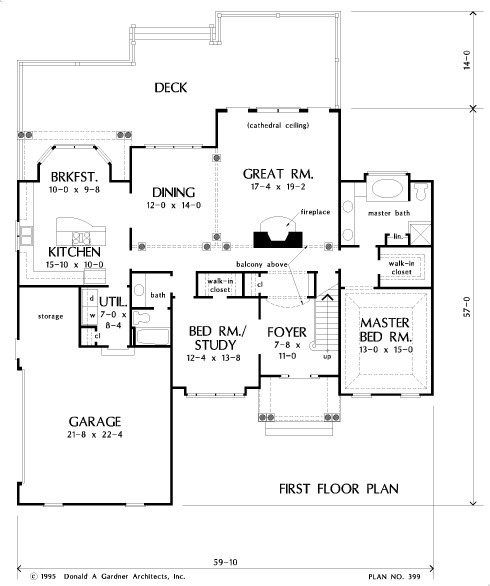 Ft.
House Dimensions: 59' 10" x 57' 0"
Great Room: 17' 4" x 19' 2"
Foyer (Vaulted): 7' 8" x 11' 0" x 17' 0"
Dining Room : 12' 0" x 14' 0" x 8' 0"
Great Room (Cathedral): 17' 4" x 19' 2" x 17' 0"
Bonus Room (Vaulted): 12' 2" x 22' 4" x 9' 0"
Garage : 21' 8" x 22' 4" x 0' 0"
Garage Storage : 8' 6" x 8' 8" x 0' 0"
Master Bedroom (Tray): 13' 0" x 15' 0" x 9' 6"
Bedroom / Study : 12' 4" x 13' 8" x 8' 0"
Bedroom #2 (Cathedral): 12' 4" x 14' 11" x 14' 6"
Bedroom #3 (Cathedral): 12' 0" x 11' 8" x 14' 6"
Porch - Front : 11' 10" x 6' 4" x 0' 0"
Deck / Patio : 18' 0" x 14' 0" x 0' 0"
Balcony : 17' 4" x 3' 8" x 8' 0"
Storage (1st Fl.) : 3' 2" x 7' 11" x 0' 0"
Storage (2nd Fl.) 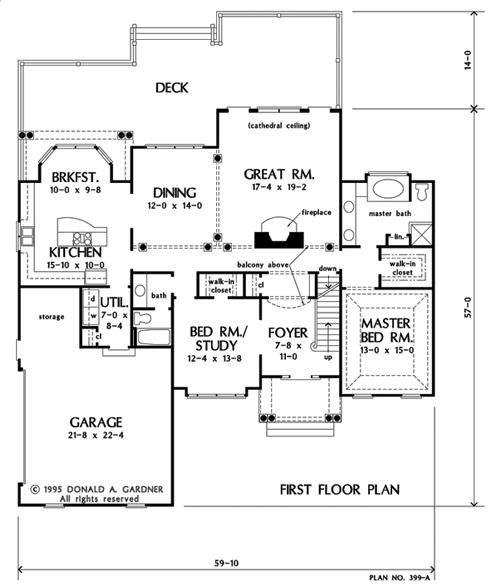 : 2' 8" x 8' 0" x 8' 0"
Kitchen : 15' 10" x 10' 0" x 8' 0"
Breakfast Room : 10' 0" x 9' 8" x 8' 0"
Utility Room : 7' 0" x 8' 4" x 8' 0"